PARKING: From NH 25 in Moultonborough turn onto Route 109 following it for 2.25 miles to the Y junction with route 171. Continue straight on route 171 another 0.5 mile turning onto Ossipee Park road. Drive up Ossipee Park Road past the stone house entrance to the hiker parking area with trail kiosk on the right. Approximately 90 minutes drive time from Manchester. 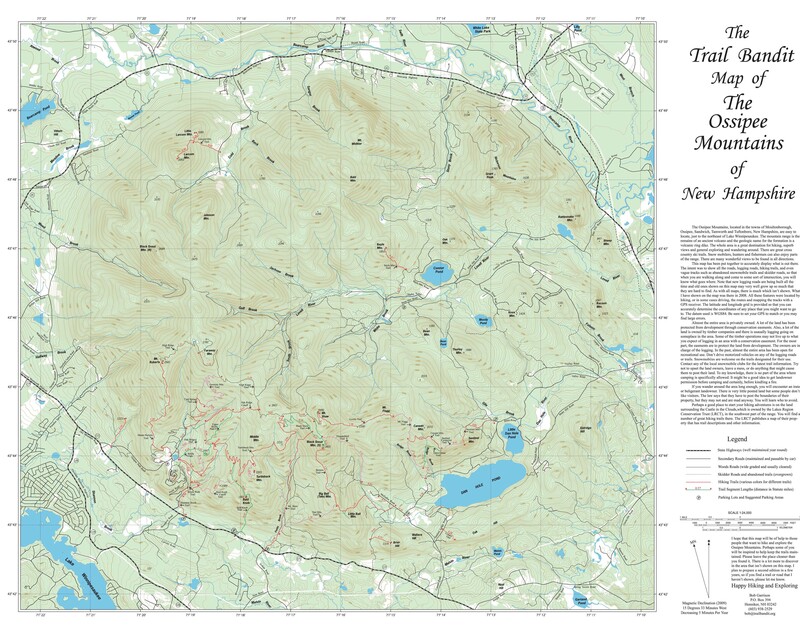 In addition to the USGS Maps a hiker known as "Trail Bandit" has created a detailed Ossipee Map of the surrounding peaks and trails. Follow the road adjacent to the trail kiosk through the gates toward Shannon pond. Continue up the hill toward the horse barn and follow signs leading to the Mt. Roberts trail which begins behind the fence. The trail is well marked with orange diamonds at regular intervals and begins along a wide carriage road before returning to the field follows the fence perimeter a short distance before turning right into the woods. Use caution at this junction as the trail is not signed and one could easily continue straight along the fence border. The Mt. Roberts trail ascends a knoll then levels off through hardwoods before reaching a rocky steep section. As you ascend, a short spur trail marked 'outlook' leads a short distance to the west and offers great views of Red Hill, Lake Winnipesaukee and the Belknap range including Gunstock Mountain ski area to the south. Both Red Hill and Belknap Mountain have fire towers on their summits. Once you've caught your breath the Mt. Roberts trail continues up a short steep section before the incline becomes more gradual over rocky ledge terrain. The last mile of trail ascends several open ridges with spectacular views in the southern and easterly directions towards the lakes and the highest point in the Ossipee range, 2990 foot Shaw mountain. After 2.4 miles and approximately 1 hour of hiking the Mt. Roberts summit is attained. The summit is marked with a sign and Faraway mountain is looming in the background. Return the way you came or continue along the High Ridge making a 11 mile scenic loop to Faraway mountain. At the Mt. Roberts summit the High Ridge trail marked with blue diamonds descends to the north and follows a wide carriage road along the ridge. The carriage road was lined with very old grey birch trees providing the feeling of going back in time a hundred years. Look for signs of moose as you follow the carriage road 1.3 miles to the Faraway mountain spur trail. The spur trail is not marked but the a ATV path leading to the left and chain gate is fairly obvious to spot. Follow the spur trail 0.25 miles to the 2783 "Mountain View" summit. The summit contains some man-made cell towers bringing you back to the 21st century. There seems to be conflicting information on the nomenclature of these peaks as well as discrepancies on various map sources adding to the confusion. In this report "Mountain View" is considered the 2792 foot peak marked with the red pointer on the map below. Faraway mountain is the closer peak containing two summit bumps at 2730 feet elevation. It appears the southeastern bump may be a few feet higher than the northwestern bump marked with the blue pointer. I couldn't find the dotted trail leading over the 2730 Faraway Mountain summit bumps and chose to bushwhack to these summits from the High Ridge trail. Once back on the High Ridge Trail the carriage road leads past a spectacular outlook offering 180 degree views to the south then gradually descends 1.2 miles to the junction of the Faraway Mountain trail marked with orange diamonds. From here it's a long 4.5 miles following the Faraway Mountain trail to the Cold Spring trail carriage roads that gradually descend switchback after switchback after switchback. These may be great for a horse and buggy but make for frustratingly tedious long walking conditions. You'll eventually pass the cellar hole of the Roberts homestead and the junction of Cold Springs Road. A 0.5 mile road walk will lead you back to Shannon Pond. The lakes Region Conservation Trust offers a patch to anyone who has hiked 30 miles along 19 trails (not all at once) over 5 summits within their property. Anyone interested in this challenge can find more information on the LRCT website. Mt. Roberts is ranked #48 on the New Hampshire 52 With a View list and worth the visit alone. For a longer adventure I'd recommend continuing along the ridge to Faraway mountain and a loop back to the parking area. Both Mt. Roberts and Faraway Mountain are on the Ossipee 10 list of 10 notable peaks in the Ossipee range. This trail system is popular but an early start may provide the opportunity to spot some of the wildlife in the region. I was able to spot several different tracks in the snow such as skunk, deer, pine martin, moose and turkey. Mt. Roberts is marked with a summit sign. Due to snow cover I was unable to search for any benchmarks. Mountain View has several man-made structures along with cell towers on its summit. and I was unable to locate any signage or markings on either of the two faraway summit bumps. The cellar hole of Isaac Roberts former homestead can be found by following Cold Springs Road for 0.54 miles then turning right for a short distance on the Cold Springs trail. The homestead was built in the early 1800's and all that remains are a cellar hole. Look for apple trees surrounding the area. The cellar hole is marked with a LRCT sign and describes details of the Roberts homestead history. For the GPS friendly coordinates are N43 44.415, W71 19.085.
wonderfully informative .. just the information I was looking for .. there doesn't appear to be much online about Faraway Mt .. I'd be curious to read more about the Roberts for which Mt Roberts was named. The site of Isaac Roberts former homestead can be found by following Cold Springs Rd approximately 0.55 miles to the Cold Springs trail. I wasn't able to see much with the snow cover with the exception of a cellar hole and an apple tree or two (across the 'street'). I've added a few details and a photo of the LRCT sign in the notes/comments section above. For those instances, you want the bypass or license to have your fence set up in movement. Do studies for your locality and attempt to recognize if fence lets in are crucial for you if it’s now not then you definitely might simply be fortunate visit this site right here.